Plan to attend, get informed, get motivated, and fill your calendar with ways to get active! 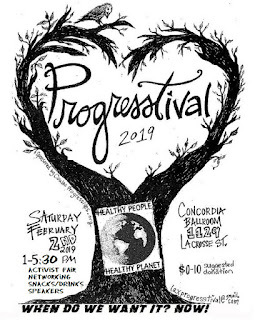 Our home grown speakers will include Dr. Mark Neumann, MD, a pediatician at Gundersen Health System who heads the Medicare for All WI 3rd CD initiatve and Kathy Allen, a Natural Resources specialist and vice chair of the Coulee Region Sierra Club leading the local Ready for 100 initiative. As usual, we'll have potluck snacks, tea and coffee, cold drinks available for purchase at the bar, and music. Your donation at the door ($0-$10) will help us pay for the event. Visit the event page for a list of all the great organizations who will be there to let you know how you can work toward this year's Progresstival theme: HEALTHY PEOPLE, HEALTHY PLANET!